Wrecked. 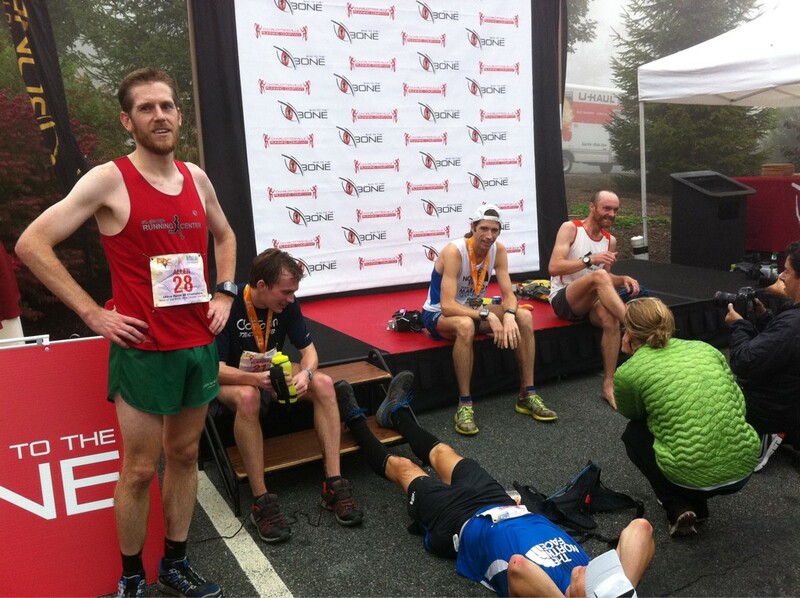 Photo courtesy of irunfar's Twitter. Love this video showing some of the fog. Plenty more videos on the UROC website. The mist lifts temporarily and second and third places are just ahead along the undulating road. As a dickhead in a Jeep tries to purposefully run us off the road, I turn to let them know what I think. As I do, I see that fifth is also visible now. Maybe two minutes separates four of the five 'podium' places and there's barely a 10k left to run on the road in the inaugural Ultra Race of Champions 100k near Charlottesville, VA. So all that can be done is to speed up and try to change the order. There were plenty of twists and turns along the whole distance and I think everyone there was suitably impressed with the organization and format of the race. Enough fast guys showed up to really push the pace and the two spot prizes for the first to the highest point (5.5 miles in) and to the 33 mile aid station seemed to make a few start quicker than they should have. It was also a great social event with established ultra legends making cameos (Scott McCoubrey and Dr David Horton) as well as a good selection of the established fast guys in the US (Geoff Roes, Dave Mackey, Mike Wardian, Dave James, etc) and newer blood showing their stuff (Matt Flaherty and Jon Allen running particularly well). There was even one of the select 10 finishers ever of the Barkley Marathon (Jonathan Basham), probably the hardest race out there - if you don't believe me, then this may change your mind. Others can tell the story from their perspectives, but here's the only perspective I had out there - mine. irunfar has summarized it well and provided excellent coverage, as did the race website. In particular I have to point out the live and near live video coverage with commentary which was a first for a trail ultra and looked amazing. The weather had been humid with torrential rain the previous day, but we started off with overcast and cool conditions. The controversial separate elite start at 7am (15 minutes before the rest of the field) included a 200m loop to go past the crowds then off down the trails. I love it when a race starts downhill since it tends to wake my legs up faster and I cruised along talking to Matt Flaherty who won the North Face 50 miler the previous weekend in Madison, WI. 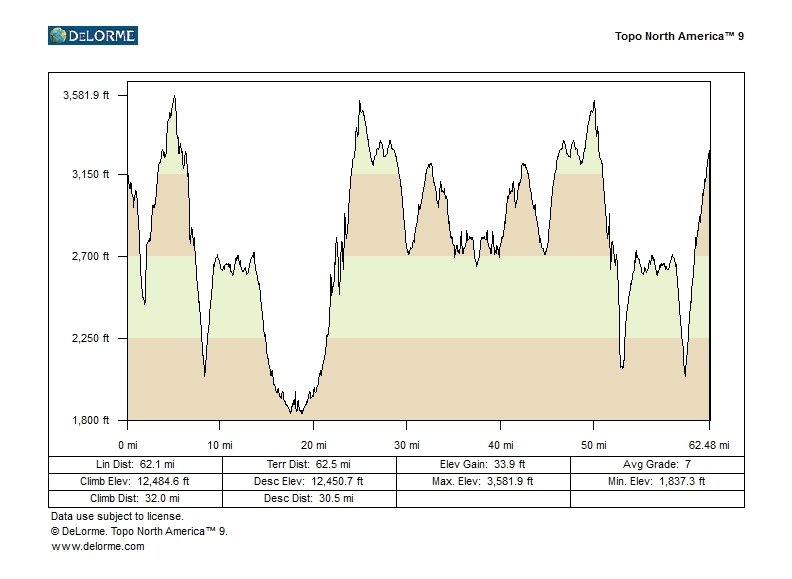 The course was hard to assess in advance, as shown below in profile with almost 13,000ft of ascent, given the frequent switches between easy trail, technical/rocky/slippery sections and roads. The very few flatter sections should also allow for a real increase in pace, but we really didn't know what to expect. The first 'King of the Mountain' prize of $200 at 5.5 miles maybe incentivized a couple of guys to go off hard but it just seemed that the pace was very fast immediately. Too fast for a 100k as tough as this, and this proved to be the case for a few guys. I settled into a walk soon into the first climb since it was taking too much effort that early on to run and I'd rather save my energy to fight later in the race. This put me in about 15th at the first checkpoint, but I wasn't far behind and wasn't concerned. Different runners clearly had different strengths and the continual changes in the running surface and gradient meant a lot of back and forth between runners. In particular there was an early 1,500ft downhill, mainly on road that saw some leaders hammering downhill. I knew that it would hurt a few people later on and tried to restrain myself to merely my 10k pace (it was hard to not go faster, especially seeing others zooming along). Dave Mackey and Scott Gall were pushing things up front at an impressive speed, but I got myself up to the cusp of the top 10 running with Michael Owen along a flatter section before heading down an easy trail to Sherando Lake aid station (17.6 miles) where we saw the leaders up to a mile ahead of us on the out and back. Michael Owen and myself must have run around 10 miles together in total but on leaving the lake for the biggest climb of the day he dropped off as the mist covered us, and soon after had to DNF, unfortunately. I was impressed by his sensible pacing and he seemed to be running within himself to save up the effort for later in the day, so was surprised to see him slow. That climb up to Bald Mountain had some technical sections of sharp, small rocks which could easily turn an ankle. But it was only 1,700ft vertically so was over soon and I caught Eric Grossman (recent Miwok 100k winner) just after the high point. I'd not felt great all day but was keeping things at a gentle pace to see if things would click eventually. They did around 18 miles but only for a short period before I felt that all-too-familiar fatigue from too much racing this year. However, like the other times (Comrades, Western States and more) it just meant a general lethargy instead of a complete crash. And the way to deal with it is to merely reduce the pace a bit rather than having to stop or slow to a crawl. Others hit really big walls, but I was wading through the fog as if it was as substantial as treacle. Just running but without the higher gears being available. Luckily the next road section was fairly easy so I could cruise through the fog even when the media crew decided to drive next to me for a mile and film. Had to put in a little more effort for that, although when I saw the footage it did look very slow...especially when immediately followed by shots of Mike Wardian running that same section. I felt basically the same all the way out to the turnaround at 37.2 miles but at least I was moving up the field. On the relatively fast trail section lasting 4.1 miles each way I was running with Jon Allen and we saw some carnage as Dave Mackey walked towards us on his way to dropping. I don't think he went too fast, just turned up feeling bad but wanted to be part of the show and he certainly led the charge. Coming back toward us we got to see the leaders and the gaps, although the fog was dense and nullified the views along the ridge. At that point Mike Wardian had three miles on me in first and looked very comfortable. Geoff Roes was next around 1.5 miles ahead, then Matt Flaherty with 1.25 miles advantage. Scott Gall had fallen down to fourth and was 0.75 miles ahead, so I knew he was slowing, but I was surprised to see 'Mr Barkley', JB, in fifth with a half mile lead over Jon and myself, who were now in sixth and seventh. Clearly the stubbornness and fitness required for 59 hours of hell on that course makes for a tough competitor in any ultra. I passed Jon as we turned to head back and caught Scott Gall walking soon after, who dropped. It was still too early to race but I tried to reel in the positions without pushing too much, too soon. It didn't help that I kept being told that JB and Matt looked tired and were 'just ahead' yet I couldn't even see them, partly due to the fog. On the way back to Bald Mountain I passed JB as he vomited and moved to fourth. With at least 14 miles left anything could happen, but I thought to myself that it looked like Mike's only way to lose would be to get lost. Maybe I jinxed him since he took a turn back down the mountain along the route we came up instead of the continuing route on a right turn. According to our Garmin comparisons at the finish line, he ran a total of 67 miles while I did 63.9, which did include a short mistake of my own of maybe 0.2 miles. So he added a 'Wardian handicap' and somehow dropped into third when he popped back on to the right route. A real shame, but Mike's a fighter and would give everything to get back to the front. He's not a DNF kind of guy, and when you can seemingly run at your peak every weekend, that's especially impressive. In the final section of single track, Jon caught me up because it was still too early to go all out when I felt as flat as I did. This is where we did a little detour to a waterfall, but then we had a climb back to the remaining road section of 8.5 miles. As we appeared, literally out of the mist, at the penultimate aid station at the start of the road, I saw Mike heading out of it and was surprised. I did a final refill of my TNF waterpack, intending to start the race proper and run right through the final aid station. Would 8.5 miles be too much for a final push? I couldn't tell, but it was now or never and there was no danger of a DNF this late on. The fog temporarily dispersed and I could see Mike and Matt ahead just as the Jeep I mentioned earlier tried to hit us. Four guys fighting for positions on the road with Geoff supposedly twenty minutes ahead. Generally I'd love this situation, especially with a few miles that were merely gently rolling at first, but I wasn't expecting any gifts. Mike's a 2:17 marathoner and Matt recently did a 2:22. 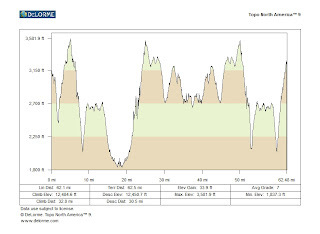 With the lack of road running I've done since Comrades I think a 2:45 would be a struggle right now so catching them would involve running myself into the ground, plus maybe some luck. The fog rolled over us again and meant I couldn't even judge whether my work was paying off or not. A couple of 6:30 miles felt like a lot faster and I was reminded of Comrades in 2010. There I'd chased Mike down at the end, but it involved running 6s to the end and was probably my best run ever. Both situations had the lung-busting, all-out sensation but this time I could tell it'd take Mike to have a very bad day for things to swing my way. Plus I didn't really want to beat him if it's only because of a wrong turn, not that that made me hold back. The final aid station was at the end of the flatter road and headed steeply downhill for 700ft vertically in just over a mile. The visibility was better and now Matt was just ahead, but Mike must have powered through the pea soup to move well into second and was out of sight. Ok, so just a 2:22 marathoner to catch over 4.3 miles of steep down then a longer, steep up. A good push for the descent got me past Matt but I felt like three more miles was too much. I tried to get round a corner on the uphill before having to walk but couldn't gap Matt enough to get out of sight and he went just past me before he walked. So, it was going to be like this. Both of us run ragged into the ground and with nothing left to push up the final hill. My walking was faster than his, but he didn't need to walk as much as me and by the top he'd gone out of sight. Much of the hill had Dave James and Jason Bryant (both had dropped earlier due to injuries) giving me updates on Jon behind and Matt in front. I was getting more concerned with Jon, but kept a lead of at least a couple of minutes over him. I'll be honest that this was the situation I'd most wanted to avoid - having to hammer out the final uphill. Too many races this year and too many draining finishes (like spending hours 'sprinting' to the finish of Western States to try to break into the top 10) had left less desire to drive myself to my limits at the close of a race. I don't mean I didn't want to try, just that when there's several hours of red-lining it takes a huge mental effort which can't be done too often or you feel frazzled. And I felt frazzled. Men's top five. L-R: Jon Allen, Matt Flaherty, me, Mike Wardian and Geoff Roes. Courtesy irunfar's Twitter. Full results here but the men's top five was Geoff Roes (8:58), then Mike Wardian (9:20), Matt Flaherty (9:22), me (9:23) and Jon Allen (9:26). Was great to see Geoff have a good result, although it looks like he had to suffer through a tough day too and wouldn't have wanted to win the race in the way he did after Mike's error. I didn't catch much of the women's race but the leaders were close each time I saw them. In hindsight, I do love the course and the dynamic of the varying terrain. But on the day I just wanted it to end and didn't need it to be a couple of miles long. Gill and Francesca put on a great event and I definitely want to return (hopefully fresher) next year. I can see this getting really big over time. A lot has been said about the prize money and how it may have motivated people, but in reality it was too small this year to have much effect (a total purse of $10,000 over five men and five women). I think what really attracted people to the run was the chance to have a tough race against great competitors and to have a genuine championship feel in a trail race, more on a par with professional sports than ultrarunning. I don't think many were disappointed at all. Next up should be a big, long rest. However, I've got the chance to run in Chile three weeks after UROC so the rest will have to wait. 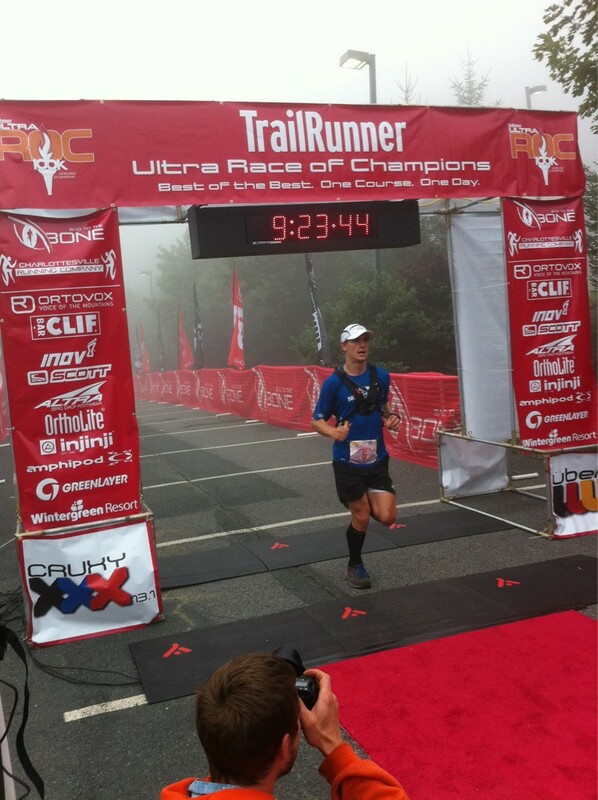 This race pummeled my legs and mind, but that's kind of why we do the sport in the first place. Great run, great write up. Crazy, the way things unfolded. Thanks for the report. Nice run, Ian- you're one heck of a tough, talented runner. It was a fun race, and you definitely gave me someone to aim for. And you're not the only one who got pummeled- funny how we enjoy doing that to ourselves. It was nice getting to know you and the other runners after the race, too. Good luck in the rest of your races this season- hopefully we can race again in the future. Ian.. nice running against you the past few races. You beat me!! Sooo.. I gotta ask it. Under what circumstances can we expect to see another Rocky Raccoon type run from you? Dave - really good question and I wish I knew the answer 100%. But probably any idiot could say that racing as much as I do doesn't help (this year has actually been a reduction). However, I turned up at RR feeling like a complete lack of long runs for almost 6 months (ie over 50k) meant I'd struggle. Probably I need to stop doing long stuff for that long...but I'm not sure I can force myself to avoid all the great experiences from ultras if uninjured. I'm kind of focusing on RR again for now since the course seems to suit me well. Oh, and I can't claim a win over you, unfortunately, given you had a 3 mile lead when you stopped :) I was also ill the week before but no way could I have matched you through 35 miles if I wanted any chance of finishing. Why not come to Rocky Raccoon? It may be 100 miles but it doesn't take much longer that a 100k, so it's more similar to that.